What is Marker, Marker Making, Marker Efficiency and How to Calculate Marker Efficiency? In this post you will find answers of the following questions related to maker making in garment production. What is marker? What is marker making? What is marker efficiency? How to calculate marker efficiency for manual marker as well as computerized marker? Marker making is the process of determining a most efficient layout of pattern pieces for a style, fabric and distribution of sizes (source: Apparel Manufacturing, Glock and Kunz). Factories those don’t have CAD system perform this process manually. In manual marker making to make an efficient marker one need time, skill and concentration. Now-a-day Marker making is mostly done by CAD systems which give accuracy, increase control over variables and reduces time required in making markers. Marker efficiency is defined as a ratio of area of marker used in a garment and area of total marker. Secondly, Glock and Kunz have defined this term in their book, Apparel Manufacturing as Marker efficiency is determined from fabric utilization, the percentage of total fabric that is actually used in garment parts. Note: Marker efficiency and Fabric utilization is not same thing. In marker efficiency calculation fabric wastage due to end bits and end loss is not included but in fabric utilization calculation all kinds of fabric wastage are included. How to calculate Marker Efficiency? Calculation method of marker efficiency has been explained below with formula. Area of marker used for garments: In case of CAD marker, CAD system automatically calculates total area of garment pattern pieces placed in a marker. So you get area of marker that is consumed by garments from CAD system. Total Marker Area: To calculate total marker area simply multiply marker length by marker width. In manual marker it is difficult to measure surface area of garments patterns in a marker. You can use a mechanical device, Planimeter, to calculate the surface area of pattern pieces from outlines of the pattern pieces. Another method can be practiced to calculate marker efficiency when you don’t have CAD system or Panimeter. 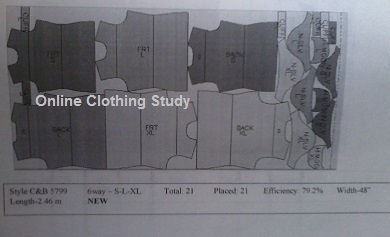 Calculate ratio of weight of fabric consumed by pattern pieces and total weight fabric under total marker area. So a separate formula is used to find marker efficiency. Weight of garment parts: To calculate weight of garment parts cut one layer of fabric according to markers and weigh all garment parts that are included in a marker. Weight of marker total area: Measure weight of fabric (one layer) of total marker area. Post your comments below in case need further clarification. Online Clothing Study: What is Marker, Marker Making, Marker Efficiency and How to Calculate Marker Efficiency? Learn about Marker, Marker Making, Marker Efficiency related to cutting fabric in the garment industry.